Sitar Arts Center helps underprivileged children become more advanced in the areas of visual, performing, and digital arts. With several programs allowing youths and teens to grow and learn through an arts education, Sitar makes an impact on the lives of children while giving them a fun and safe environment to express their inner artist. The program currently has more than 800 students, about 80 percent of whom come from lower-income housing. Providing children with the chance to pursue creative ventures inspires them to reach their full potential. Sitar Arts Center programs allow students to explore, be creative, and express themselves while discovering their artistic strengths. They also learn important skills including critical thinking, public speaking and writing. The help of partnering organizations and volunteer artists from around the DC area has made it is possible for Sitar Arts Center to be the success they are today. Founded on the belief that every child should have access to an arts education, Sitar Arts Center stays true to the mission by providing children with the resources to achieve goals and be more confident in their education. Gala Hispanic Theatre was born, in 1976, out of Teatro Doble, then the only theater in the DC area catering to Spanish-speaking audiences. The mission of Gala Hispanic Theatre is twofold: To bring Hispanic and Latino plays to Spanish-speaking members of the DC-area community, and to bring the English-speaking population awareness of the rich offerings of Hispanic theater. In addition to enhancing the theater-going experiences of DMV residents, Gala Hispanic Theatre offers dedicated bilingual educational programs to DC-area youth, including a free after-school program for youth 12-18. These programs help enhance language skills and literacy, improve self-esteem, and strengthen cultural identity and knowledge of other cultures. Founded in 2001 by Dr. Adrienne Clancy, ClancyWorks focuses on positive social action through community engagement, senior citizen programs and arts education. “Adrienne attacks everything with an equal amount of passion and enthusiasm,” said ClancyWorks intern Maia Stam, a senior at Goucher College. ClancyWorks offers four strands of arts education – in-school K-12 residencies, in singular assembly presentations, in after school programs and through college and university residencies. “Youth development is really at the core of our educational work,” Erin Tunbridge, Program Coordinator, said in an interview. They partner with multiple organizations, including Excel Beyond the Bell and the DEA Youth Dance Program. Board member Camille Harris came to know ClancyWorks as the director of The Boys and Girls Club of Silver Spring, when she offered daytime practice space in exchange for dance classes for the kids in afterschool attendance. This is the philosophy employed by ClancyWorks Dance Company in its facets of arts education work. Through the concept of ASPIRE, students learn about social consciousness and about becoming active, engaged citizens in their communities. Students keep journals, write informal critiques, and learn not just dance steps, but job and life skills. Each student is given the opportunity to take on a leadership role. "It's not just that whoever is loudest is the leader," said program coordinator Erin Tunbridge. "Although we may not have known it at first, the powers and characteristics that we chose for our superheroes deeply represented the inner traits that were hidden within ourselves -- the traits we knew we had but were too afraid to reveal; or the traits that we always had and never knew about. Interestingly enough we all had the same idea -- a female superhero that broke the stereotypes, and bettered our community and the world." You're never too old to dance. Okay, so The SOAR (Seniors Organized in the Arts to Rejuvenate) program at ClancyWorks Dance Company might not be a training ground for an NBA hip hop dance team, but it provides a physical and mental workout for seniors aged 55 to 98. Which is pretty badass in its own right. "It’s an opportunity for (seniors) to get together and open up different parts of their lives," said Erin Tunbridge, program coordinator at ClancyWorks. "Rather than just meeting each other and talking about the weather, we’re initiating different conversations." The classes include both seated and standing work for a variety of agility levels. Much of the focus, Erin said, is on using dance to exercise the memory as well as the body. Students might be asked to choose a word to complete a sentence, and offer a movement to go along with the word. They're tasked to remember each movement, then to put them all together. Et voila, a dance! Now, doesn't that sound more fun than flashcards? Upon entering The Museum of Unnatural History, visitors are greeted thusly. This is Harry the Swear. “Swear” is derived from swamp + bear. He lives inside the Museum, which houses not only Unicorn Tears and Primordial Soup, but also 826DC. At 826, students aged 6-18 are advised on creative and expository writing skills. Through programs that take place both on-site and in school, the children learn to appreciate the arts of writing and storytelling through creating books. 826DC bases its model on the 826 Valencia program founded by writer Dave Eggers in 2002. More than a decade later, the 826 National program boasts eight affiliates, all of which are dedicated to enhancing writing skills and helping teachers create literary arts curricula that allow students to thrive. Tara Campbell has been volunteering with 826DC for two years. She started as a tutor, she said, and now helps host field trips. In one activity, the students create the beginning of a spy story together, and then each child writes his or her own ending. In another, the students work first in groups, then in pairs, then individually, to create a “Choose Your Own Adventure” story, inspired by the Edward Packard books of the ’80 and ‘90s. Once a week, 826 volunteers and staffers do Reading All-Stars one-on-one tutoring sessions at Tubman Elementary. Tuesday field trips are in Spanish. On field trips to 826DC, students are taken through the process of creating a book. They create a story while a volunteer types. An illustrator is on hand to draw pictures. The lessons often reflect what the students are learning in school, and each child is given the opportunity to contribute. “We’re really working with the schools,” said Areesah Mobley, director of development at 826DC. Tara recalled one student who seemed particularly quiet, but who demonstrated a great talent. Phoebe has struggled with depression more than half her life. In This Is My Brave, Phoebe has found a platform to talk about her experiences, and a community of people who give her understanding, and even admiration. Jennifer Marshall founded the organization in 2013, after writing a blog for What to Expect about being a mother living with bi-polar disorder. Though Jennifer had written a blog, Bi-polar Mom Life, for a number of years, she’d always done so anonymously, fearing the stigma that can accompany mental illness. “A lot of the stories about mental illness tend to be tragedies,” she said. “You don't hear the success stories of people who have overcome it. It can be scary to hear stories of mental illnesses left untreated and a tragedy happened. We are bringing positive stories into the light." After Jennifer's piece appeared on a national website, people reached out to thank her for sharing her story. "I realized what a relief it was to open up about that part of my life." Upon launching a Kickstarter to fund the first show, Jennifer and associate producer Anne-Marie Ames were stunned to see that support was plentiful. Today, This Is My Brave puts on full-length shows in multiple cities, including DC and Boston, performs at schools, hosts yoga classes and more. All the cast members and producers volunteer their time. A team has formed to support cast member Annie as she runs a half-marathon for the cause. In June, This Is My Brave will open Mental Health America’s annual conference, in Alexandria. Phoebe compared being a part of This Is My Brave to being on a sports team. Photographs courtesy of This Is My Brave. Slideshow of works from Life Pieces to Masterpieces. All images property of Life Pieces to Masterpieces. This is how a group of 3 –and -4-year-old apprentices (students) at Life Pieces to Masterpieces decided to decorate their cupcakes. Life Pieces to Masterpieces is a program aimed at African-American boys and young men in the underserved areas of the District of Columbia. 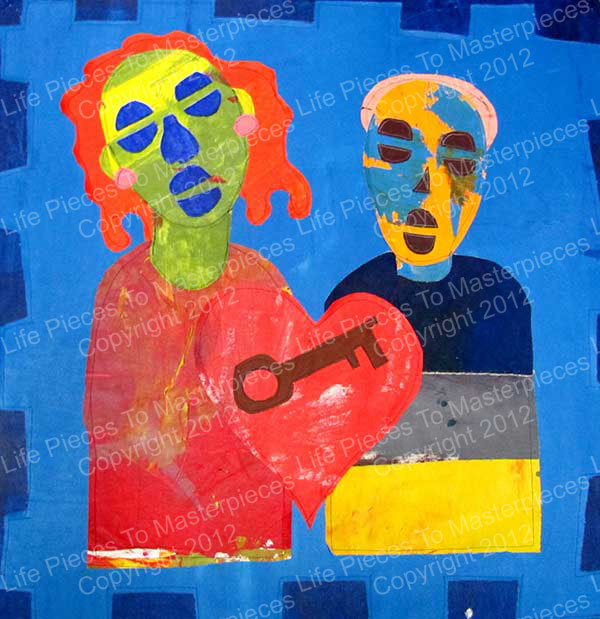 Founded in 1996, LPTM fosters creative drive and uses art as a form of collaboration and meditation. The apprentices practice a specific form of art in the style of founder and artist Larry Quick. Today, the after-school program serves 117 African American young men ages 3-25 still using an art method like Quick’s with a program built on the sturdy foundation of their human development system. The majority of apprentices live in Wards 7 and 8. “It’s easy to live in DC and never escape your Foggy Bottom bubble, to never go east of the river,” said development manager Mignotae Kebede, who grew up in an Ethiopian family in California. Typically, 5-6 apprentices work together on each piece. The process starts with meditation and journaling. Then it opens up to a group discussion, sketches of what the art will transform into, and finally, the group heads to the art room where they paint their canvases and stitch together a creation. Eventually they add a title and a poem or story to accompany the piece before it is complete. Several of the works created by apprentices of Life Pieces are currently being curated and will be displayed at the National Museum of African American History and Culture set to open in 2016. Life Pieces to Masterpieces has a broad definition of creativity and encourages the apprentices to understand that everyone is born with creative abilities, something they are good at. They just have to find the medium—whether it be yoga, music, poetry, science or hip hop. But some of the apprentices find that they truly do have a passion for the roots of LPTM, in the art room. A seven-year veteran of Life Pieces, Cateo said he didn’t really get into the art until about four years ago. His favorite piece is his self-portrait. As an International Affairs and Anthropology major at George Washington University, Mignotae spent much time traveling and studying development in other countries. She came realize, however, that similar issues were happening right in her own backyard -- that she could apply a lot of what she learned abroad locally. The Shield of Faith is one of the many building blocks of the philosophy behind LPTM. Composed of a wheel of several colors, each represents a value. For example, brown signifies discipline and black, a combination of all of the other colors, signifies leadership. LPTM uses the Shield to encourage noble behavior as well as a way to teach the apprentices symbolism at an early age. The tiny cupcake-makers were decorating their treats to represent a value from the Shield. “We made Power Ranger cupcakes because they’re leaders…” said Josh, 3. He looked around to see the positive reaction of the classroom. Then, he asked the ultimate question. About the Author: Olivia Rios is a writer for the Daily Do Good. She thinks Power Rangers are cool and cupcakes are even better! 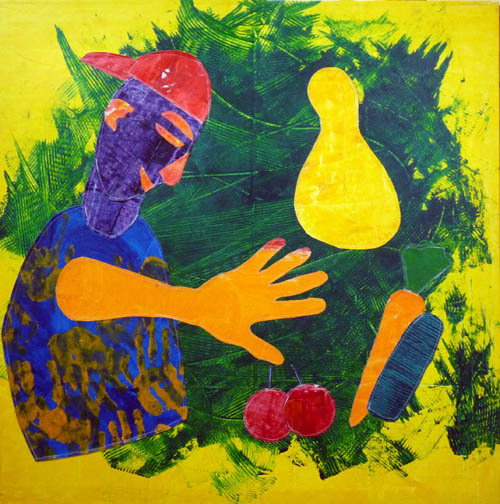 Two years ago in Austin, Tex., Paulina Sosa and a group of painters wondered how they could use their art to bring attention to the issue of urban poverty. Their aim was to bring together allies and inspire action against homelessness and hunger, rather than depress people and make them feel hopeless. They formed a collective called Painting Out Poverty to work on this problem. But last fall, Sosa moved to Washington, DC to start her Master of Public Health at George Washington University. End of the group, right? As if a five-class courseload, three jobs and a health internship at the World Health Organization weren’t enough to keep her busy, Sosa launched POP in Washington, DC. The group landed a Knapp Fellowship for Entrepreneurial Service-Learning, a grant established by GWU to support social entrepreneurs who want to have an impact on the DC community. Now, just a year after Sosa touched down, POP’s network of visual artists has expanded to include writers, musicians and an impressive array of community arts organizations. Its first event was a March fundraiser and book drive in conjunction with Reading Partners. And that was just the beginning. On Aug. 15, Painting Out Poverty hosted a day-long kick-off at the Westminster Presbyterian Church around the theme “The Healing Power of Art.” The work of local artists adorned the walls, and representatives of organizations such as Street Sense, Fuerza Contra Alzheimer’s and the Capitol Hill Arts Workshop sat ready at tables to discuss how their organizations use the arts to combat poverty and illness. One of the attendees was too big to fit inside the venue: A bus, painted white with gold dollar accents, sat in the parking lot outside. I Have a Home Here is a mobile, community-based art installation meant to illustrate the realities of poverty in the city. In a previous installation the bus was rendered invisible, representing the invisibility of the homeless. Future plans include creating a temple to homelessness in the interior of the bus, and making it a base for an interactive game of Homelessopoly, where players move around the board with backpacks, cardboard boxes and shopping carts, and give donations to Street Sense to get out of jail. Back in the church, the day’s program began with an all-star panel, moderated by Juanita Hardy, Executive Director of Cultural DC, in which representatives from the DC Commission on the Arts and Humanities, Will Rap 4 Food and Town Hall Education Arts Recreation Campus (THEARC) joined CHAW, Fuerza Contra Alzheimer’s and the pastor of Westminster Presbyterian to discuss how artists and arts organizations can empower people, develop communities and transform lives. Hardy provided the business case for the arts by detailing how arts centers have created jobs and led to economic development in communities like H Street and Columbia Heights. So what’s next for Painting Out Poverty? Sosa says POP will partner with local organizations on painting and writing workshops in schools to empower students to tell their stories. She envisions a journal of short stories and poems about poverty, hunger and homelessness to raise awareness of how these issues affect children. Another project Sosa has in store is to enlist graffiti artists to create a mural as a joint effort with community members, who would not only help design the work, but would also participate in the painting process. About the Author: Tara Campbell is a DC-based writer of crossover science fiction. Formerly a painter, she’s now content to stand back and write about people who can really wield a brush. What do interior design and domestic violence have to do with each other? Well, imagine starting from zero, rebuilding your life and then creating a whole new space for your new life. At Room to Rebloom, it’s about more than redesigning homes – it’s about creating spaces, where women can go to feel safe, in control, and strong enough to stand on their own two feet. The clients are involved throughout the entire design process so they feel a sense of ownership. To become a client of Room to Rebloom, the women must already have their own housing, whether it’s a one-bedroom home or an apartment. Furthermore, they must be referred by an organization or program that provides domestic violence survivors with emergency and transitional services and other resources that may come in handy during this difficult time in their lives. Part of Room to Rebloom’s success has to do with the fact that several companies donate furniture, home décor, paint and other much-needed materials. The companies include Ikea, Sherwin Williams, House of Ruth, and the American Society of Interior Designers. In a way, the newly-designed homes serve as the final step for these women to be able to go on and live the life they’ve always wanted and more importantly, the life they deserve. The only professional theater in DC dedicated entirely to arts education has an ambitious mission: To inspire young people to realize the power of their own voices. Karen Zacarías founded Young Playwrights’ Theater in 1995 out of a desire to use her experience with art to positively impact her community. Since then, the program has exploded. YPT has produced more than 350 plays and reached more 13,000 students, performing for nearly 100,000 people across the DMV. Through playwriting, YPT “develops students’ language skills, and empowers them with the creativity, confidence, and critical thinking skills they need to succeed in school and beyond,” according to the organization’s website. YPT’s vision is to seek social justice by empowering all students, especially those who from underserved areas, to value their own voices and opinions. YPT runs several different types of programs throughout the year: both in-school and after-school programs, a summer writing workshop, and the Young Playwrights’ Workshop. In addition, YPT also collaborates periodically with theaters, museums, and other institutions to create works that are relevant to current events. Each in-school program culminates in the New Play Festival, an annual “celebration” of the voices of YPT’s students. YPT chooses several plays from its group of students and partners each writer with professional actors and directors to put on their plays in front of a public audience. The 2016 festival will take place at three different venues in DC over the course of three weeks in April. “Seeing my play performed was the best part [of the program]. It was so cool to see how the play had come so far, and the creative choices that were made… I had never written a play before then, and the experience definitely made me catch the playwriting bug. I've been writing them ever since,” said Nana. YPT’s upcoming performance, “Girls Write Out!” is coming to DC on Monday, October 19th, at the Forum in Sidney Harman Hall. Featuring four plays written by YPT student playwrights age 8-15, the production is part of the Women’s Voices Theatre Festival. YPT’s model of teaching has garnered attention from media across the nation, and the organization has won numerous awards, including the prestigious National Arts and Humanities Youth Program Award from the President’s Committee on the Arts and Humanities in October of 2010. The award was presented to YPT by First Lady Michelle Obama, and solidified the importance and success of YPT’s work with students. In the future, YPT hopes to expand to even more schools across the area and reach even more students. “A lot of people are drawn to arts education—I knew that it was important because of the meaning of the arts in my own life, but it wasn’t until I saw that transformative power in these students that I really understood the meaning and power of the arts. I want to make sure every student is successful,” said Brigitte. About the Author: Marisa Weidner is a graduate of The College of William and Mary. She has volunteered as a teacher in Belize, and in homeless shelters in the United States. Marisa chronicles her explorations of DC on her blog, The Curated City. That’s what Girls Rock! DC asks young girls throughout the DMV. Through a yearly summer camp and the eight-week Girls Rock! After School Program at The SEED School in Southeast, Girls Rock! DC teaches girls the confidence they need to become smart, successful women. And why do girls rock? “Cause we’re awesome. I’m awesome,” said Dayanah, a 9th grader. “Our mission at Girls Rock! is to empower young women and female-identified persons to find their own voices, be heard, be loud, be different than what they’re typically being told to be, and we do that through music education,” said Frankie V, head of GR!ASP. SEED resident advisor Janice Carroll was the force behind bringing Girls Rock! to the school. “Because of my background interest in music, in DJing, I was like, let’s try this.” She began volunteering at the summer camp after seeing a SEED student perform at a showcase. The first day of the program, each girl chooses an instrument and starts learning to play. From there, they’re put into bands that each write a song to perform at the end-of-term showcase. While learning their instruments, the girls learn social skills and meet new friends. “I recognize my talent more, and it’s not just singing and dancing, like today I realized that I’m good at the drums too,” said Dayanah, who has been in GR!ASP since it started last year.“...It has helped me a lot to recognize who I am as a person and my musical talents." The girls carry the lessons they learn playing music into their everyday lives. “I remember her almost freaking out (at the showcase), because she didn’t want to perform…,” Janice said. She credits Girls Rock! with helping Sydney believe in herself. By sharing what she was going through, Frankie helped the girls gain perspective. After that, they were able to put aside their fears and differences. The girls also use the program to express themselves and to get away from everyday life. “I think it’s peaceful. Like you can talk to your band coaches or you can let (it) out through your music,” said Madison. It’s not just the girls who benefit from Girls Rock! Frankie said she’s learned the value of selflessness, and being a good role model to young women. She recalls being nervous when her band played the lunch time at camp, but by the end of the set, all the girls practically rushed the stage. While working for the Institute of Musical Traditions in 1995, Busy Graham noticed a problem. There was a need for top quality arts enrichment programs in schools and few work opportunities for artists during the work week. “Arts can play such a vital role in helping kids finding their path to a good, healthy life,” she said. Graham wanted to connect creative arts and artists to schools and underserved communities. Thus, Class Acts Arts was born. Since then, CAA has grown into an accredited, award-winning regional outreach arts education nonprofit that brings arts programs to school and underserved communities in the DMV. CAA has reached more than 5 million young people via more than 25,000 artist programs, according to executive director James Modrick. “(Class Acts Arts) brings the arts to people where they are,” said Modrick. Artists visit schools, youth detention centers, and other community-based organizations. The interactive programs include workshops, performances, and artist residencies. CAA’s programs introduce schools and communities to a variety of art forms, such as storytelling, puppet shows and dance, among others. Visual artist Carien Quiroga teaches CAA’s Project Youth ArtReach program in detention centers, correctional facilities and crisis centers, as well as with children in hospitals. While CAA works in many venues and with different populations, the bulk of programming is focused on youth. “(We) engage children’s minds in a different way that opens their minds and motivates,” said Modrick. CAA’s teaching model doesn’t include grades or teaching to the test. Instead, CAA artists try to bring out students’ talents by encouraging them to excel without making them feel like their work is wrong. Workshops by CAA artists allow participants to take positive risks in a supportive environment. The non-judgmental spirit of Class Acts Arts can be especially beneficial for students who are struggling academically or behaviorally. Performance by Snowday, an a capella group that works with CAA and has performed twice at Cedar Lane School. Denise Rocco, general music teacher at Cedar Lane School, a self-contained program for students with severe disabilities, sang the praises of CAA. Because some students’ disabilities preclude them from attending live performances in public venues, CAA visits to Cedar Lane afford the children opportunities they might not otherwise have. Music in particular, Rocco said, can help break down barriers and have positive physical and mental effects on her students. Modrick believes art is in everything. “(You can) find creativity and artistic engagement in everything you do,” he said. The nonprofit’s programs teach audiences how art is a part of other subjects including, but not limited to aviation. environmental science and social studies. Flutist Dr. Andrei Pidkivka and violinist/singer Dr. Solomia Gorskhivska are Ukranian performers in the music ensemble Gerdan (sometimes partnering as Duet Gerdan). Their performances introduce audiences to various aspects of Ukrainian culture. Gerdan performance as part of "A Ukrainian Montage" on April 25, 2010 produced by the Ukrainian Dancers of Miami at the Broward Center For The Performing Arts, Fort Lauderdale, Fla.
A folk music demonstration, for example, might include stories of shepherds. They wear cultural costumes, rich in colors and patterns. After seeing Gerdan perform, teachers and students have said they have a better understanding of Ukrainian culture. On return visits, however, students have told him that the performance inspired them to take note of news from Eastern Europe, or that they chose to study Ukraine for international projects. Recently, CAA partnered with Passion for Learning, Inc., Big Learning, and Sligo Middle School in S’team Sligo, a leadership development project to engage students through STEAM activities. The students created a curriculum that reflected what they were learning in their class lessons. They wrote a song about Sligo Creek , and worked with the artists to create a mural. This is a key lesson of Class Acts Arts’ programs. Some of Carien Quiroga’s PYA students have told her that they would have taken a different path if they had been introduced to art earlier. She recalls one student in particular, a young man who took part in several workshops. About the Author: Rolena M. King is a writer and marketing, communications, and branding professional based on the East Coast. She enjoys the arts, and her favorite form of art is dancing. In 1988, inspired by studies that showed the benefits of art on Alzheimer's patients, scientist and sculptor Lili-Charlotte "Lolo" Sarnoff founded Arts for the Aging. Twenty-seven years later, Arts for the Aging is a thriving nonprofit that serves more than 600 programs each year. "Unfortunately a lot of people tend to overlook older adults, think they don't have anything to offer, or aren't valuable to society, when in fact that's not the case," said Brandi Rose, program director at AFTA. The programs, she noted, provide social engagement and interaction for the aging clients, particularly those who might struggle to connect with others in a traditional manner, which can become a challenge for people afflicted with dementia. "They have so many memories and thoughts," she said, "so many ways they can express themselves." Arts for the Aging offers two types of programs: Joy in Generation is for seniors who are more frail, while Arts Alive! (yes, with an exclamation point) is a sequential learning series for participants who are independent and high-functioning. Disciplines include healing movement, music, dance, creative writing, and drawing and painting. Nancy Havlik is the co-director at Quicksilver, an AFTA-sponsored dance company of people ages 65 and up. Her dancers, a few of whom are in their late 80’s, she said, often volunteer to accompany her on visits to community centers and nursing homes, where she leads workshops. Teaching artists are all paid for their planning and instruction time, a reflection on founder Sarnoff’s respect for artists’ work and time. Programs are often cross-disciplinary, with two or more teachers collaborating to create an offering that draws from multiple art forms. Havlik has enjoyed collaboration with several fellow AFTA artists, such as storyteller Candace Wolf. The collaboration she did with Nancy emphasized, she said, “the movement of language, or the language of movement.” They designed a series focused on animals – what animal do you wish you were, what animal frightens you, etc. About the Author: Holly Leber is the editorial director for The Daily Do Good. Upon learning about the benefits of arts programs for aging persons, she immediately emailed the information to her parents. For the, um, future. “Dance can change the world. If you can dance, then you can start a revolution,” says Greg David, the current artistic director of Culture Shock DC. CSDC operates as “a troupe of individuals who, through the power of music and dance, cultivate self-worth, dignity, and respect for all people…through professional entertainment and youth outreach,” according to the organization’s website. The organization emphasizes three things: community outreach, artist development, and innovative performance. The majority of the organization’s staff are volunteers who commit to keeping the company running and perform in addition to working other jobs full-time. A nonprofit dance organization, Culture Shock DC was founded in 2001 by Margareta Chughtai, who was a core dancer with the original Culture Shock chapter in San Diego. After moving to the east coast, she and co-founder Brian Resurrection wanted to establish a branch of Culture Shock in the DMV area. In 2009, CSDC was incorporated as its own 501c(3) non-profit and has since grown to encompass five different dance crews and more than 120 dancers in the company overall. Over the past 15 years, the company has gained a reputation for the level of excellence they bring to each performance, attracting members from as far away as Virginia Beach. “We offer something to dancers that makes the commute worth it,” said director of operations Cameron Bennett, who has been with the organization since 2012. CSDC’s age-based dance crews allow it to cater to dancers of all ages. There are three programs for youth: Mini Shock (ages 5 and under), Mighty Shock (ages 6-13) and Future Shock (ages 14-17). As dancers progress in both age and skill, they can move up through the various crews — allowing them to maintain a connection to Culture Shock throughout their childhood. CSDC’s youth program first took shape in October 2005, when Lisa Norman, a longtime dancer in the company, took over the program. “Future Shock started with thirteen kids… then ten months later we had 60 kids show up to audition,” said Lisa. CSDC’s reputation does most of its advertising for them, and they are able to draw large numbers of dancers to auditions through their events, word of mouth, and the performances they put on throughout the year. “I wanted to take on Future Shock because as a child, I grew up with low income and my passion was to dance. This was my way of giving kids access to affordable dance, and giving back to the community,” Norman said. “To me, outreach is reaching out to any child in any neighborhood—our job as leaders or mentors is to help them no matter what. Outreach means reaching out, period”. One of the most notable aspects of CSDC is the emphasis it places on community enrichment. Every Future Shock crew member has to maintain a 2.75 GPA in order to dance, and all are required to participate in community outreach events. CSDC does a wide variety of community service outside of its scheduled events, ranging from packaging potatoes and food for the needy to school performances. The shows at DC public schools function as a way to raise awareness of the power of dance to kids who wouldn’t typically think of dance as an outlet. Culture Shock dancers put on a performance and then teach the kids a routine. Culture Shock’s 7th annual Youth Showcase took place on March 20, 2016. All images from CultureShockDC.org or the company's YouTube page. Staying cooped up anywhere can be difficult for anyone, but facing the four walls of a hospital room 24/7 can be especially tough -- draining even. For nearly 20 years, Only Make Believe has brought happiness to thousands of children in hospitals and care facilities across the DC area through live interactive theater. To date, approximately 45,000 children have been impacted by OMB’s services, and that number continues to grow each year. Because OMB knows that “freeing a child’s imagination is a valuable part of the healing process,” the organization works with a team of professional actors to provide interactive theater for sick children using nothing by a backdrop, along with a supply of props, costumes and imagination, of course. What happens next is quite magical to say the least. By the end of the show, the same children who were having the worst day imaginable and didn’t intend on participating are dancing, laughing and having fun. Professional actor Chris Wilson, who joined OMB four years ago, calls days like these a job well done. Founded by Dena Hammerstein, OMB honors the legacy of her late husband James “for his dedication to the theater and her passionate love for children in need.” But, as soon as trips to the theater proved to be too much for many of the children, that’s when the idea of brining the magic of theater directly to them emerged. According to the OMB website, the actors spend six consecutive weeks and put on six different shows at each hospital, so the kids can get to know the actors and vice versa. For the finale, OMB likes to flip the script, pun intended, by giving the children an opportunity to step into the spotlight and recreate all the past shows they’ve seen. To bring the children some much-needed comfort, the props and costumes stay at the hospital long after those six weeks are over. Even better, all of OMB’s performances are free thanks to its generous supporters. Throughout the year, the nonprofit hosts several fundraising events, including 5k runs and cocktail parties. Hours of work go into being able to properly execute each show and OMB’s dedicated volunteers play a crucial role by helping to set up shows and creating the costumes that are used in each performance. OMB has garnered both local and national attention from many since bursting onto the scene in 1999 with a long list of accomplishments to its name. In addition to participating in the Children’s National Medical Center annual holiday party with First Lady Michelle Obama, OMB has received grant awards from the DC Commission of the Arts & Humanities, as well as several Ronald McDonald House Charities around the DC area. Much of OMB’s success has to do with its longstanding partnerships with several local businesses and corporations, including Avenue Capital Group, Bloomberg and Disney, who make in-kind donations and co-facilitate arts events and smaller fundraisers. While OMB serves as an escape for many children facing difficult times, Aldridge pointed out that the therapeutic power of theater also gives them the tools to bolster their self-confidence and outlook on their future. About the Author: Princess Gabbara is a Michigan-based journalist whose work has appeared on Ebony.com, Essence.com, BET.com, Huffington Post Women, Sesi Magazine and many others. You can read more of her work on her blog. She also tweets @PrincessGabbara. As National Autism Awareness Month comes to a close, we wanted to shine a light on an organization working for individuals on the autism spectrum. And while the majority of DDG's featured orgs are based in the DC area, this one is so cool, we had to step outside our usual boundaries (hey, we all have to do that sometimes, right? ): Face Value Comics, out of York, Pa., has created the first-ever autistic superhero. Founded by Dave Kot, who has autism, Face Value Comics helps spread the message of autism awareness, while also striving to help those on the autism spectrum improve their communication skills. Most of all, Face Value Comics allows people, especially teens, living with autism to see someone like themselves portrayed as a hero. You can support Face Value Comics by downloading issues for a donation. November 1st marked the 10th anniversary for Critical Exposure, where the education is multi-pronged: Teach students documentary photography skills, and teach them to use those skills to make a difference in their schools and communities. Critical Exposure works with low-income students in DC area high schools, offering both afterschool programs and in-school partnerships at no cost. There are three primary benefits to the students, Adam said. First, they learn that they have the right to question things, and more importantly, to try and change what they believe is not right. Presently, Critical Exposure fellowship students are using their photography and advocacy skills to protest the school-to-prison pipeline, which pushes at-risk students, often minorities, out of the education system and into the penal one. Second, they learn the power of collaboration and working together. As a teenager, Delonte Williams wasn't headed down what one might call the right path. He had, he said, an "I don't care" attitude. "I was willing to put myself in a bad situation," he said. "I was exposed to hurt and I never found anyone who taught me how to deal with it." Expelled from his first high school, Delonte re-enrolled at Luke C. Moore High School. It was there that he first encountered Critical Exposure. It was through the program that Delonte said he felt respected for the first time. "They gave me a chance to share my pain rather than telling me what they think is right," he said. "In Critical Exposure, I felt like I would be accepted no matter what I said." Through conversations about leadership and advocacy, Delonte learned about right and wrong, and about systems of power. He also learned about the power of a photograph. "I didn't think about how much meaning (a photo) had until I thought about using one for change," he said. "A picture is probably worth more than a thousand words. Maybe a million." Today, Delonte, now 21, is a facilitator for Critical Exposure. He received his high school diploma in 2013. He leads students only a few years younger than himself, taking them through the process of planning projects, and identifying and tackling issues. He wants to give them the same self-confidence he gained. "I want them to understand the power of youth voices. I believe young people have a very strong voice. I think they can make history. I want to encourage them." And what about? What does Delonte believe the future holds for him? Critical Exposure teaches students about leadership and advocacy through the process of documentary photography. The following photographs were submitted by Critical Exposure. They represent the work of the students who participate in the program. The 2013-2014 Fellowship class at Critical Exposure has been turning their lenses on the school-to-prison pipeline, in which disciplinary practices and zero-tolerance policies in DC city schools force more students away from their education and toward the risk of incarceration. The students are advocating the implementation of a restorative justice program in DC schools. The following text is a transcript of a speech delivered by Critical Exposure student Gina, on Nov. 13, at the District of Columbia Public School FY15 Budget Hearing. The videos were produced by members of the 2013-2104 Fellowship class. Good Evening Chancellor Henderson. Thank you for hosting this meeting and giving DC youth the opportunity to speak. My name is Gina. I’m a senior at Luke C. Moore High School and I live in Ward 8. I am speaking on behalf of the Critical Exposure Fellowship Program. We are a group of DC Youth working to implement restorative justice programs in DC. What is Restorative Justice? Restorative Justice practices reduce the need for unjust punishments and suspensions, by building a community within the school where students feel supported. Restorative Justice programs are being successfully adopted in public school districts across the country, including some schools in Baltimore City and Montgomery County, Maryland. Students in DC are being pushed out of schools by harsh discipline. My younger brother, for example, gets suspended every time he steps into schools for minor reasons. The last time he was suspended for 10 days because he spoke out of turn in class. Another time it was because he was not wearing the correct uniform. In the 2011-2012 school year there were more than 10,000 suspensions in the DCPS school system. If we start using Restorative Justice we can decrease that number, and benefit the students as well as the administrators. We believe that Restorative Justice programs will also prevent fights and other incidents, decrease the rate of student dropouts, and increase graduation rates. We want to ask you to include funds to start a Restorative Justice pilot program in a DCPS high school for the Fiscal Year 2015. We have collected over 100 signatures from DC residents in support of our campaign, including Councilmember David Grosso, Monica Warren-Jones from the DC State Board of Education, and DCPS teachers, parents and students who believe in Restorative Justice. On behalf of the Critical Exposure Fellows, I want to thank you for taking the time to listen to our ideas.